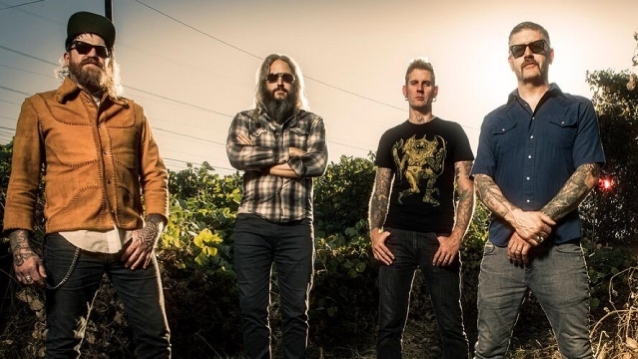 MASTODON drummer Brann Dailor has confirmed to Sweden's RockSverige that the band is working on material for the follow-up to 2017's "Emperor Of Sand" album. Explaining that he and his bandmates have a long way to go before the new LP is done, Dailor said that they have spent many months converting its rehearsal studio in Atlanta into a recording facility. "A couple of years ago we, as a band, bought a building in Atlanta and turned it into practice spaces for bands," he said. "The two major practice space facilities in town both closed down like in the same month, so there were hundreds of homeless bands, basically. If it was for practice spaces like that, we wouldn't be a band because we relied on those spaces. We lived in apartments and there was nowhere to jam. "We just finished construction on the bottom, the basement of the building, and in doing so, we took two rooms and turned it into a studio," he continued. "We got everything hooked up; everything's up and running. We got my drums set up and we really wanted to hear what the room sounds like or what it's capable of, so we had a track that was… I mean, we wrote it in a couple of days. I had a few riffs and went to Bill [Kelliher, guitar] and said, 'I've got these riffs.' and he went, 'Well, I've got this riff that fits with that,' like we do, and then we started working on it. It yielded something really cool and we all liked it. "Our main goal of doing that was just to see if we can make an album here in this room," he said. "If we got these raw tracks and we get it to a proper mixer, can it match our previous sonic output? It has to be on a certain level for us to go, 'This sounds like a real album,' or, 'This sounds like a demo,' and we can't have that, so fully anticipating being saddened by 'this sounds like a demo and it's not gonna fly,' the opposite happened and it sounded amazing. We were, like, Awesome!' So that's like a sorted thing." "Hopefully it will lead to more fruitable… I don't want to say faster, because we're pretty fast and we've put out a lot of records, and sometimes we'll have our album written and finished and we just won't say anything, because we don't want to leave home yet," Dailor explained. "When we're gone for two years, we owe the people that are back home a year of our time, obviously and we want to be home and give them that time. And that time is not… we don't get a full year sitting at home; there's no way. We're doing one-offs here and there and we'll go away for a month. We say that were off for a year writing, but it's not like that. When you're gone for two years, it's not like life stops, so there's all sorts of stuff you've got to deal with and tend to and relationships that you want to keep, so you've got to hunker down. But having said that, there's a ton of material. Brent's [Hinds] got a ton of crazy stuff. Just wild and I've never heard anything like it and so does Bill and so do I. We all just kind of have the same kind of deal." Asked what happened to the "heavy" new song that MASTODON talked about releasing earlier this year, Brann said: "We wanted to release it right ahead of this tour, and we were trying really hard, and we had one foot in the studio and one foot on the airplane coming to Europe, and it just didn't really come together as quickly as we wanted it to. It's finished — the song is fully finished and it's mastered and ready to rock — but we'll just have to wait to release it. It would've made sense to release it ahead of this tour because we have Scott Kelly [NEUROSIS] with us and he sings on some of it, so that would've been cool. We missed by a week or something and then we were stupid and went and blabbed about it like it was going to be a done deal. We thought it was going to be done sooner, but there were some circumstances that got in the way, unfortunately. But it's still a kickass song and it's pretty heavy." As for a possible release date for the new MASTODON album, Brann said: "I think next year would be smarter [than this year], on our part. We need to let people miss us, maybe." MASTODON won a Grammy in the "Best Metal Performance" category at the 60th annual Grammy Awards in January 2018 at Madison Square Garden in New York City. MASTODON got the nod for the song "Sultan's Curse" from "Emperor Of Sand", with the latter also being nominated for "Best Rock Album." It was the fourth and fifth time MASTODON had received Grammy nominations, having missed out on the three previous occasions — "Colony Of Birchmen" (2007), "Curl Of The Burl" (2012) and "High Road" (2015) — it had been up for the "Best Metal Performance" award.